Light, airy and silky to touch, our scarves are one of a kind, literally. Our designing process allows you to choose from your own patterns, designs or photos. You can add text or messages too. These scarves are perfect as a gift or a way to treat yourself. The best way to touch up an outfit is with a scarf, it’s an essential fact. But are you over all of the prints you see every day or feel no store is selling what you crave to express? Well, the only way you can find a scarf with every detail done the way you want is to create it yourself. Perfect for women who are trying to be a step up on the competition, and want a one-of-a-kind in their closets. Perfect for men who are staying elegant, modern, and fashion forward in their style. The choice of size allows you to create a neck scarf, shawl, wrap, or our most popular use, head scarf. I have purchased 3 scarves from Bags of Love to give as gifts. Each one was produced beautifully and delivered amazingly quickly. The recipients could not believe their eyes in seeing photos so meaningful to them residing in a scarf. They made comments such as "This is the best gift I've ever gotten", and "I will treasure this always". Two of them now want to design scarves to give to others. I ordered several scarves printed with my own original art as an experiment, and was so pleased with the result I ordered more. Service is super quick too. I ordered on Tuesday and received on Friday. The scarf is beautiful, the print clear and crisp and the turn around time quick. From start to finish a great experience. Web site easy to navigate and presented all options and accurate proofing. The fast turn around time is also the best level I have experienced. Shipped and arrived as stated. The finished product was even better the I could imagin. This was my second order and both recipients loved their scarfs. I look forward to my next project with them. When you design your own scarf, you have the ability to make it look however you want. Choose your favorite fabric from five chic options. From real silk to snuggly soft muslin, there is a fabric fit for every purpose. Your personalized scarf also comes in a range of sizes and hemming options. Go for a large, square shape to create fashion-forward looks, or for a longer and slimmer version to enjoy wrapping it around your neck. Photos and designs will look simply stunning when printed onto your scarf, you could even create a photo collage scarf if you can't decide. A unique and cutting-edge accessory, that is a guaranteed gift winner! When you buy more, you save more. 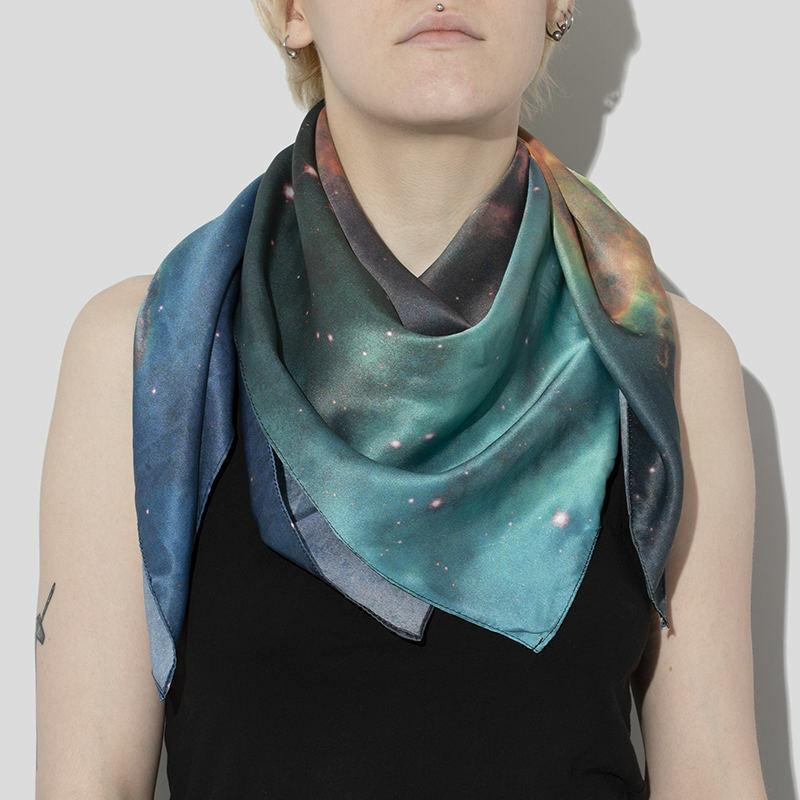 Treat yourself to a gorgeous handmade image scarf and save money when you buy a second. Please get in touch with our customer service team for more information about your wholesale discount options, no minimum order. Every women's photo scarf is handmade to order by our team of skilled craftsmen. From print to cutting, to hemming, there isn't one step in the process that is mass produced. We offer two hem types for your scarf. Baby hem uses 0.31" of material on each side, folded twice then a top stitch approximately 0.08"-0.12" from the edge. The three thread overlock trims off 0.12" fabric and has an overlock edge stitch. When you make your own design online, it is important to consider which fabric you want to use for your printed scarves. Each fabric has different qualities, that make them unique. Our gorgeous silk fabrics are 100% natural, so no chemicals have been used on the fibers. Due to our specialist printing method, you will receive prints that have intense colors. You could also opt for one of our poly blend fabrics, which are printed using a slightly different method and results in rich colors, a stunning way to wear your photography with love. If opting for the natural silk options, please note that the grain of the fabric can result in a slightly wavy edge, apparent on two sides of the hemmed fabric. This is due to the natural softness of the silk and its beautiful, delicate nature. The edges can be wavy, and this is to be expected, especially on the Georgette. Your scarf will be super soft to the touch, have amazing show through quality, and the print will be permanent.